2 years 83 - 88 cm - 32,7-34,7" 52 cm - 20,5" 48 cm - 19" 56 cm - 22,1"
3 years 91 - 96 cm - 35,9-37,8" 54 cm - 21,3" 50 cm - 19,7" 58 cm - 22,9"
4 years 99 - 104 cm - 39-41" 56 cm - 22,1" 52 cm - 20,5" 60 cm - 23,6"
5 years 105 - 110 cm - 41,4-43,3" 58 cm - 22,9" 53 cm - 20,9" 62 cm - 24,4"
6 years 111 - 116 cm - 43,7-45,7" 60 cm - 23,6" 54 cm - 21,3" 64 cm - 25,2"
Orders are shipped from Paris, France Monday through Friday from 10AM – 5PM (CET). Orders placed on Friday evening, Saturday and Sunday, will be processed on Monday morning. Please note that we aim to dispatch all orders within 24 hours, but sometimes it may take up to 48 hours. Once your order has been shipped, you will receive email confirmation of your shipping details and a tracking number. You are able to view and track the status of your shipment. If you are not happy with your order, you can return it back to us. All items must be returned within 14 days of receiving your order for a refund. We do not accept returns after 14 days. If you found you ordered the wrong product, please make sure you return it, in all of its original packaging. The product must be un-used. For hygiene reasons, we cannot offer refunds or exchanges on goods that have been opened, or used. If the product is faulty, damaged or if your shipment is lost, you can contact us to request a full Refund. Please send us a picture of the damaged shipment. 1. Email us at orders@trendbee.com to request a Return Authorisation, by stating your order number and the reference/s you wish to return. Please specify the return reason / detail. 2. Returns must be sent to us with a shipping service of your choice and its tracking number provided to us. 3. Please send your return within 7 days after you have received the Return Authorisation. Once we receive your return, you will be notified by email and a refund will be issued. We advise you to use a shipping courrier with a tracking number. Refunds are processed within 5 days from the date of return and will be credited to the original form of payment (Paypal or Credit Card). We will be unable to refund your cost of the original shipping if you decide that you do not want the order after it has already been processed and sent out to you. - have their original box or bag. For all orders returned from outside of EU, please specify on your package "return of merchandise for non-conformity" and no commercial value in order to avoid import taxes ( which will be deducted from your refund ). 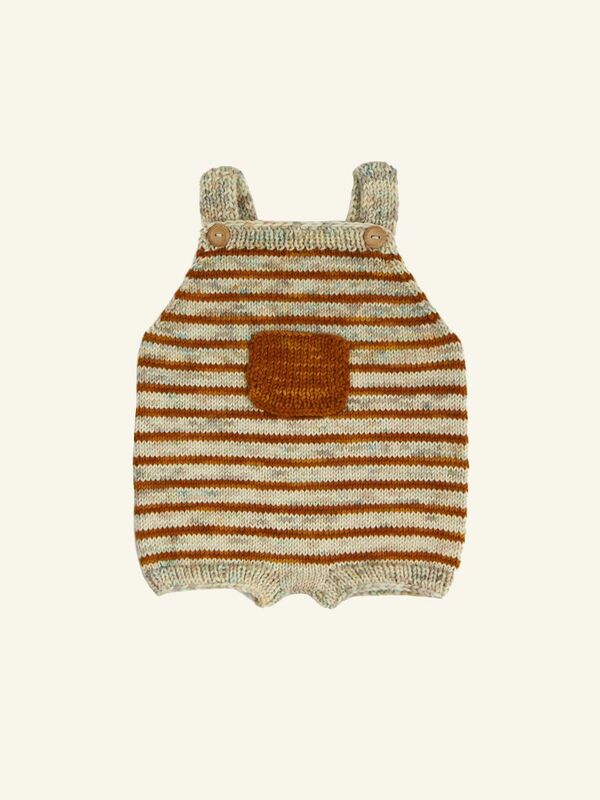 Handknitted gold mustard Adira romper. Two wooden buttons on the suspenders. Made of soft merino wool. Contact us every day, 7 days a week. Simply return within 14 days for a refund or an exchange. We accept Credit card and Paypal payments.